You altered your pattern until you got the fit you wanted. You cut each piece carefully, making sure to follow the pattern layout to avoid any mishaps. You took extra care in sewing each piece using techniques that would give it a professional look. Then why did it still end up in the “ain’t never gonna wear this” pile? Because you chose the wrong fabric. OOPS! Has this ever happened to you? (Both of my hands are raised!) Today, especially for sewing beginners, I’m going to give you some tips on how to choose the right fabric for your garment. Success is never guaranteed in any sewing project because something can go wrong during any part of the process. This brings back the memory of the time I cut a hole in the pants I was making for my best friend in high school. I was almost finished-all I had left was the hem. And she needed them the next day. And the hole was in a place that couldn’t be hidden with a shirt. But the fabric I chose was perfect. So, while choosing the right fabric doesn’t guarantee the complete success of your project, it is a very important first step. By the way, I fixed the hole with a piece of fusible interfacing, which I don’t recommend, but happened to work in this case. Unless you looked real close. And she wore them anyway-to my relief. A. Use the fabrics listed on your pattern. What if I’m not familiar with the pattern’s fabric suggestions? The weight of the fabric and how it drapes. Is it stiff and heavy like denim or lightweight and flowing like chiffon? The texture and how it feels. Fabrics like velvet and corduroy, which have a pile, will require you to lay all your pattern pieces in the same direction. Fabric with a one-way design will also have to be cut with the pattern pieces all laid in the same direction. These are referred to as a fabric with nap and is also noted on the back of your pattern and in the pattern piece layout instructions. The care instructions. Usually located at the end of the bolt, the care instructions are also important in the success of your garment. Is it machine washable or dry clean only? Some fabrics may need to be washed (like denim) or dry cleaned (like wool) before use to preshrink it. If it’s not preshrunk before you cut and make your garment, there’s a big chance that it will be too tight or small after it’s first wash or dry cleaning. I personally try to avoid all fabrics that are hand wash only. I do not like to wash anything by hand unless I absolutely have to. You may have your preference too, like not wanting to pay to get it dry cleaned. This is another reason why the care instructions are important. Buy some of the fabric and test it. Don’t trust your memory, especially if you decide not to buy the fabric right away. You don’t need a lot-a half yard or 1 yard. A half yard to 1 yard should be enough to see how it drapes on your body or dress form and use for future reference. You’ll also be able to take it home and sew a piece of it to see if it’s easy to sew on your sewing machine and serger and also test pressing temperatures and interfacing. This helps you to work out as many headaches as possible before you invest a lot of time or money in the fabric. Note: when you ask for a swatch in some fabric stores, they will only give you a very small piece, as in a smidgen, which will do nothing to help you make a fabric decision. If you shop in a warehouse type store, it’s possible that neither the fabric name or care instructions will be available. Use the search box. I’ve noticed that some Web sites have eliminated the search box. For some reason they think people don’t use it. I use the search box all the time to save time. 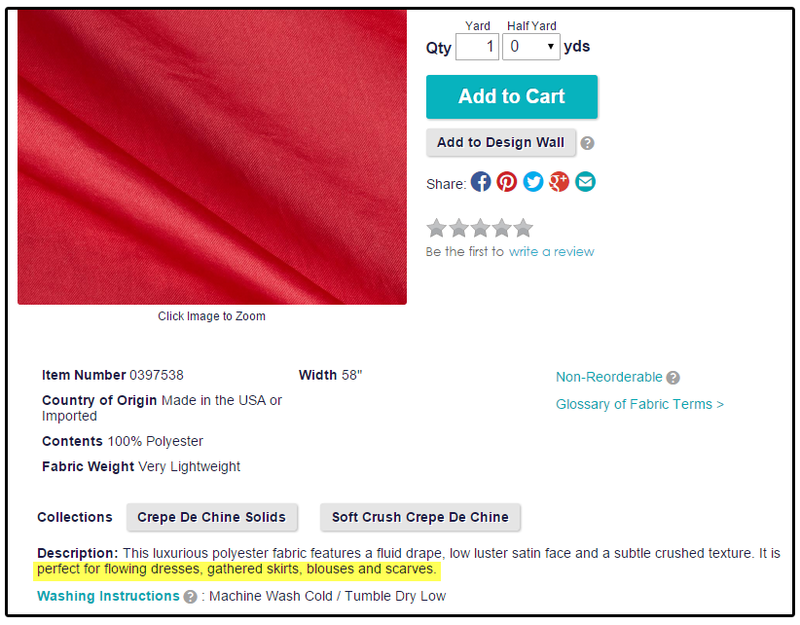 Type the name of the fabric you’re looking for in the search box, like I did on the fabric.com Web site, because it may not be listed in a menu. If they have the fabric, it’ll come up with all the colors they carry. When you click on the fabric, it gives you more details – the width, fiber content and care, etc. But what’s also included is what types of garments the fabric is suitable for, which I highlighted in yellow in the image below. (Click to Enlarge) Also, if you already have your fabric and you’re looking for the right pattern, you can use this information to determine what type of pattern you need. Order a swatch of the fabric. If just reading the details of the fabric isn’t enough for you, order a swatch to be sure. I’ve seen swatches for as low as $1. You can wait until you need more swatches of fabric and order them altogether. The swatch will give you something to touch and feel, although it’s really not enough to see the drape of the fabric. If it’s a fabric you really like or want, order 1 yard of it. This gives you enough to see how it drapes on your body, to test on your sewing & serger machines and to really feel the weight of it. Also, some web stores charge you close to the amount of a full yard for just a half yard. It’s more cost effective to buy 1 yard and have plenty to test and play around with. Both methods of getting to know your fabrics may take a small investment, but it’s far less than investing money and time in 2 or more yards of fabric and never wearing the garment. B. Join a fabric swatch club. I recently renewed my subscription to the Vogue Fabrics by Mail swatch club. They send out fabric swatches bi-monthly and you get groups of coordinated fabric swatches with recommendations for the types of garments they’re suitable for. You get swatches for a particular season, for example, they’ve already sent early spring, the next set will be for the spring season. 9 color stories. And as I mentioned above, the swatches are color coordinated. 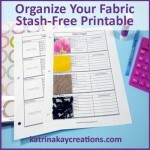 This is great if you need help putting different fabrics and colors together. The swatches are already stapled to the page. Other swatch clubs I’ve belonged to, you had to do this yourself. It may not seem like a big deal, until you accidentally mix up the swatches and have to figure out what goes where. Yep, been there, done that. They recommend linings and notion. They suggest the type of clothes the fabric is best suited for. 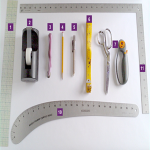 This is extremely helpful since you only have an approximately 2″ x 3″ swatch. 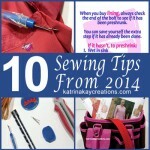 They suggest sewing patterns from independent pattern designers. They do the fabric choosing for you. All you have to do is follow their recommendations. And you might already have a similar pattern in your pattern stash. They have special offers available to subscribers only. You can earn bonus points for merchandise credit. This is not the only fabric swatch club, it’s just the one I use. For those of you who have the fabric already but need help choosing the right pattern, Craftsy has a blog post on how to pair fabrics with sewing patterns. Choosing the right fabric is like any other aspect of sewing – the more you do it, the better you’ll get at it. So as you get more comfortable with fabric, don’t be afraid to experiment and test. You may get a few good surprises. 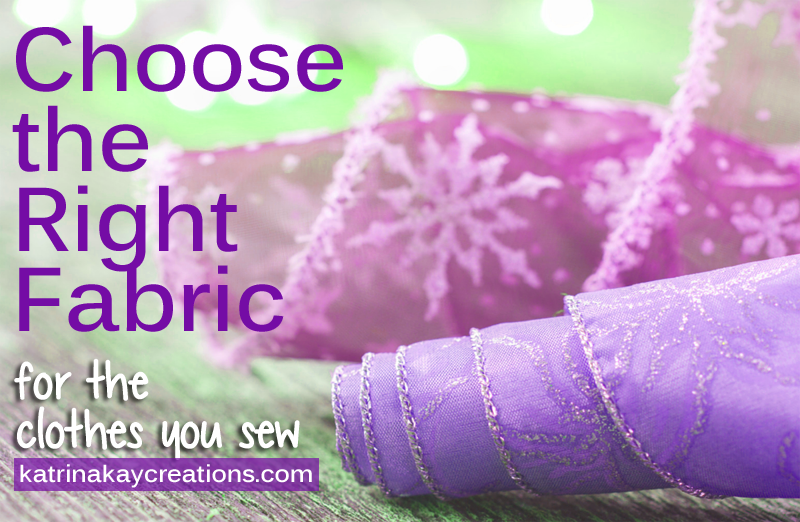 Do you have a different method you use to choose the right fabric or something to add? Or do you have a sewing mishap you’d like to share? Share it in the comments. In my opinion, choosing a fabric is such an important part of a project. That is why I really appreciated your tip to look it up on the internet to find the best possible type. As I look for a fabric company I will keep this in mind. I totally agree, Alexandria. Fabric can make or break a project. The Internet allows you to look in more than just local stores. And you can order a swatch or a small yardage if you need to. Thanks for commenting. My wife wants to start a project re-upholstering a couple of chairs in our living room, but she isn’t sure what fabric to use. I really liked the suggestion to get a swatch of fabric in order to get an idea of whether or not the fabric will be right for your project. I’ll be sure to pass the tip onto my wife since I’m sure it would help her stress less about fabric material going forward with her project. I’m glad I could help, John. She can also check their minimum amount to purchase if she’d like a bigger piece. If she can get an eighth or quarter yard minimum, that would help her in selection as well. I wish her much success with her upholstery project! You’re welcome, Mary. Thanks for reading. You’re welcome, Leslie. Thanks for reading. Thanks sew much for this informative article,especially about purchasing a yard to really see if the fabric for you! God Bless You for all you do for us! Happy Sewing! You’re welcome, Dara. Thanks so much for reading and taking the time to comment. Another great article! I really appreciate this article on choosing fabric and swatch clubs. This is an area in which I still lack confidence. I had no idea how helpful a swatch club could be! I’m going to look into this further. Please accept my condolences for your loss. It’s always sad to loose someone we love and admire. Yes, Debbie, swatch clubs are very helpful. And even though it’s just a small swatch, you still get to touch and feel the fabric. Thank you so much for your condolences. It gets better and better each day. And thanks for taking the time to comment. It’s good to see you have a new post up. I know I have made a lot of mistakes when it comes to fabric choices so this was helpful. Sorry for your loss, especially since you guys were so connected through sewing. I pray that the Lord Jesus Christ will get your family through this time of mourning and that He will give you all peace through this time. I’m glad this was helpful, Katelin. Thank you for your sympathy and support. I don’t know where we would be without the peace of God. And knowing my aunt lived a committed life for Him is very comforting. I think I know just how you feel about your aunt. My mother did not sew and I learned from my aunt. She was so much inspiration and I still miss her after several years. Hope you will find joy in the memories that outweigh the pain of parting. I’m delighted to hear that you are back. Thank you for the interesting article also. Looking forward to anything you care to write about sewing. Not many of my friends sew anymore. God Bless you. Yes, Mary, I do find joy in the memories of my aunt. 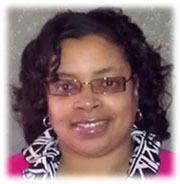 She was a very giving person, more concerned with others than herself. I’m glad you had such an inspirational aunt and you were able to share the joy of sewing with her. Thank you so much for your encouraging words and for your support. I really appreciate it. God Bless. it’s good to have you back ! I’m really sorry for your loss, take care. It’s good to be back, Fatou. Thanks for reading and for your support. Thanks Katrina, for this reminder! You help us “sew” much! God bless you!!! P.S. I would love to meet you one day! I’m glad I can help, Dara. It would be great to meet one day. Thanks for reading & God bless.